Zambia's Patson Daka scored the goal which gave the hosts a 1-0 win over Guinea in front of an enthralled Heroes Stadium in Lusaka. Hosts Zambia got off to a flying start in the Under-20 Africa Cup of Nations when they beat Guinea 1-0 in front of a packed home crowd at the Heroes Stadium in Lusaka. Austria based Patson Daka put on a match-winning performance as he picked up a split pass before slotting the ball in the net in the 48th minute. Daka, who stars for FC Liefering, had been tormenting the Guinea backline for the better part of the first half but had to wait until the second half to get his reward. The hosts started on a fast-paced note that saw Zambia register the first threat as early as the second minute when Mohammed Camara appeared to trip Daka although no foul was given. The urgency shown by the Zambians suggested they would score an early goal but the Guineans stood resolute at the back to repel the rampaging - though wasteful - junior Chipolopolo. Daka was back on the frontline after Boyd Musonda set him up in the ninth minute but the Burkina Faso referee Juste Zio flagged him offside. As the hosts pushed themselves, Guinea were comfortable soaking up the pressure. Guinea were forced to defend yet again when Musonda failed to make the most of an inviting ball which ran across the face of goal only to be swept away by Camara. 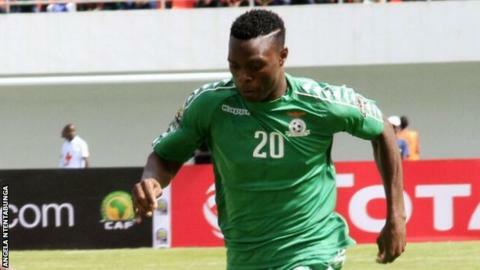 The clearest opportunity for Zambia fell to Enock Mwepu whose header went skywards from a corner. Coach Beston Chambeshi was getting impatient with his forwards and surprisingly threw in Emmanuel Banda for Conlyde Luchanga with two minutes to go to half time. The two sides went into the break locked at 0-0, but the Zambians came back stronger. They fired successive shots at the Guinea goal in the first three minutes of second half before finally getting their goal through Daka. Guinea almost equalised in the 52nd minute when Momo Yassane's head tested Mangani's reflexes, but the hosts held on to record an opening victory. Zambia will next face Mali on Wednesday. Egypt and Mali drew 0-0 in the other Group A match on Sunday which means Zambia are early group leaders after the first round of games. In Group B, Senegal will play Sudan while Cameroon will lock horns with South Africa on Monday. All four semi-finalists will also qualify for the Fifa Youth World Cup in South Korea in May.